Hardtop version is the most often and popular version of Honker. Steel bodywork is mounted at the ladder type chassis trough flexible silent blocks, allowing unique bending ability of both chassis and bodywork. Chassis is settled with pair of rigid axles by leaf springs. This is the most simple and classic car concept, which will bring you everything you expect from the type of vehicle like Honker. 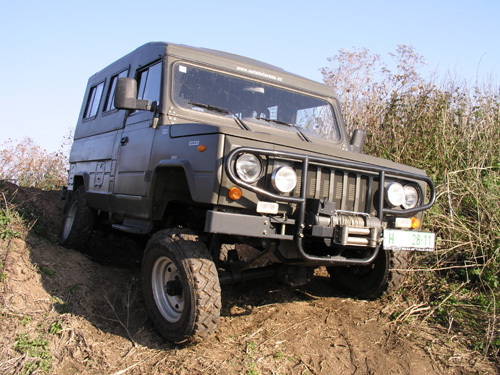 It will bring you further, then any other offroad car, with all equipment or luggage you might need. Honker vehicles are equipped with Andoria ADCR engines, which exceed the competition in reliability, simplicity and price of the common maintenance. Engine dispose of only the most basic computer control, repairing and servicing Honker is easy and inexpensive. Primary 5 speed gearbox is extended for reduction gearbox. It is possible to choose from permanent 4WD, or detachable 4WD, where you can detach front drive and use your Honker for the road use as a comfortable saloon car. Honker is respectably large vehicle, especially inside. By tilting the rear seats, comfortable two-place bed will be made, or after removing the seats you can convert your honker to mobile workshop, technical maintenance vehicle, or with appropriate platform for example ultimate 4x4 mobile home.